One of the fundamental aspects of Puerh tea is that it will change with time. It’s what distinguishes puerh from all other teas. In my previous blog post [ http://crimsonlotustea.com/blogs/puerh/10505477-what-is-puerh-exactly ] I explained the bacteriological process that allows puerh to live and breathe and age. Early on in my puerh journey I was focused merely on enjoying puerh daily. As my journey has progressed, my interest in collecting, storing, and aging puerh has increased. My confusion has also increased. I have read voraciously on the topic of storing and aging puerh and have found it hard to find anything but contradicting information. It seems that for the topic of storing and aging puerh only time itself is the true teacher. The left brained part of me is all for some scientific exploration, but standing on the wrong side of a 20-30 year experiment is quite intimidating. The simplest advice is intended for those puerh purchases that are meant to be enjoyed in the near future. 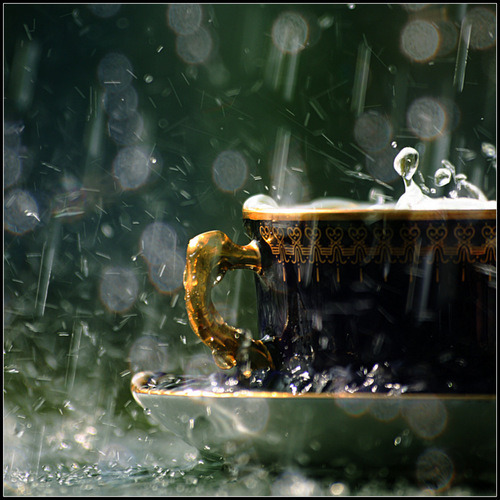 Store the puerh in a dark, cool, odor free, dry place that is safe from dramatic temperature fluctuations. This makes sense and is perfectly reasonable for the short term. Storage for the long term, with the intent to age, is a different matter entirely. This means storing puerh that you feel will benefit from the wisdom of time. You are responsible for the puerh. You have to take care of it. It’s a low maintenance relationship, but it still needs to be taken seriously. From the readings I have done on this topic a consensus holds that the storing and aging done on puerh for the last 30 years in the tropical climates of Southeast Asia, Hong Kong and Singapore specifically, has produced the most flavorful environment for puerh. Outside of Asia there has been little to no long term puerh storage that has been documented and communicated. There is even discussion over whether puerh should be stored in a constant temperature and humidity or allowed to fluctuate with the seasons. When successful tea merchants from SE Asia are asked the secrets to storing and aging puerh the answer is sometimes simply “I put it on the shelf”. I am in search of a little more direction. I should point out that there is a slight difference in aging when it comes to the two different types of puerh; Sheng and Shou. Both will benefit from proper storage, but it is only Sheng (Raw / Green / uncooked) puerh that truly benefits from aging. Shou (Ripe / black / cooked) puerh is force matured early in its life during the production process. It is a process created to mimic old and aged Sheng. Because Shou does most of its maturation before leaving the factory it benefits little from aging. Shou puerh is intended to be consumed within 10 years. The real magic of aged puerh comes from Sheng puerh. It starts off typically bitter and astringent, but with age can mellow into something truly remarkable. I’ve built a small puerh humidor (simply named ‘pumidor’ by the internet). Two of them actually. Currently this consists of two large plastic sealable tubs that I took the pain to ensure were odor free. I separated my puerh between Sheng and Shou and sealed them into each tub. Inside each tub are cigar humidifier packets that keep the tubs at 72% RH (Relative Humidity). I also added digital hygrometers to each so I can keep an eye on temperature and relative humidity. The tubs sit unceremoniously, and unobtrusively, in the corner covered with a dark sheet, and are primarily used as a table to hold junk mail. I’ll open them when I am going to get some puerh to drink. Otherwise they are happy to sit there aging. This is sufficient for a small collection, but it has got me thinking of larger scale collections. It wouldn’t be hard to build a climate controlled room where puerh could be stored long term with controlled temperature and humidity. It might get expensive to maintain over a multiple decade time period though. It would be best if Mother Nature could help with the heavy lifting. The Seattle area can be quite humid. It rains often, and there are large bodies of water in close proximity. I wasn’t really certain how humid though. I needed specific data. I specifically needed data for my exact neighborhood. It is easy to find weather data online, but most sites only detail current information. Some sites hold historical data, but most likely only for the airport closest to you. This wasn’t going to work. What I wanted was a multi year dump of raw temperature and humidity data for as close to my house as possible. While browsing http://wunderground.com/ I noticed that they allow locals to set up their own weather stations and upload the data to their site for processing and storage. As it turns out my neighborhood’s Parks Department has installed a few in the area and has been uploading data to wunderground.com since 2006! I found one weather station very close to my house and began the process of harvesting the daily data into a local file that I could use for some good ol’ fashioned data munging. Data Munging, is defined by wikipedia as “the process of manually converting or mapping data from one ‘raw’ form into another format that allows for more convenient consumption of the data with the help of semi-automated tools. This may include further munging, data visualization, data aggregation, training a statistical model, as well as many other potential uses.”. I’m a software geek by trade so this kind of challenge is one that I love. The data files I was collecting quickly grew in size. One years worth of weather data gathered every 5 minutes was easily 10MB. Google Sheets died with little fanfare at each attempt to import that data for analyzing. More munging was needed. I parsed through the data to pull just the temperature, dew point, and relative humidity info. This dropped the average yearly file size to around 2MB. However, at more than 100,000 rows per year Google Sheets again was unpleased at my attempts to force that much data through. I reworked my scripts to just pull the data from the top of each hour through the year and was able to get some interesting graphs. I decided to write a more ambitious script to average out all the information and create one unique entry per day. After some tweaking I had a 6.75 year data set of daily temperature, dew point, and humidity from a weather station within a mile of my house. I created a timeline graph in Google Sheets and I wanted to write about my findings here. What began as simple curiosity turned into quite a fun and challenging project. I had hoped to be able to directly publish the interactive graph that Google Sheets provides access to, but sadly tumblr wouldn’t allow that. This static image gives the same information. For clarity sake I removed the dewpoint data from the graph. The graph is fairly straightforward. It shows time on the x-axis and maps each days data appropriately. 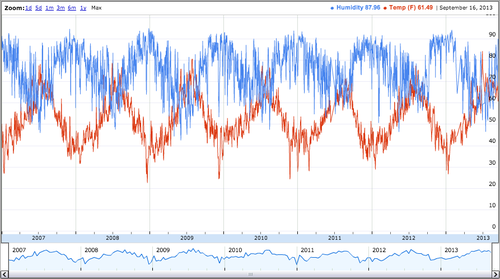 Humidity (blue) spikes in the rainy winters as temperatures (red) drop, and temperature spikes in the summers as humidity drops. This shows just how humid the area I live in is. Humidity easily averages 70%! Rarely does the RH even drop into the 50’s. Armed with this information I felt more comfortable leaving puerh in a cabinet or on a shelf. I don’t feel the need to build a climate controlled room. I keep my house on average about 67° and the hygrometers I’ve set around show that inside humidity is roughly 5% lower than outside. These aren’t the same conditions that SE Asia has, but I’m at least confident that I won’t kill the puerh. Perhaps time will show that Seattle aged puerh has qualities all its own. I’m going to keep experimenting with the pumidor though. I have some plans to build a microprocessor controlled setup that I can program with some specific environmental setups I have been curious about. More on that later. I still have unanswered questions and hesitation concerning the aging and storage of puerh, but at least I feel I am headed in the right direction now. I look forward to tasting and recording the changes in aged puerh over the years. I find myself wishing for a time machine to jump 30 years into the future and see if I am doing it right.